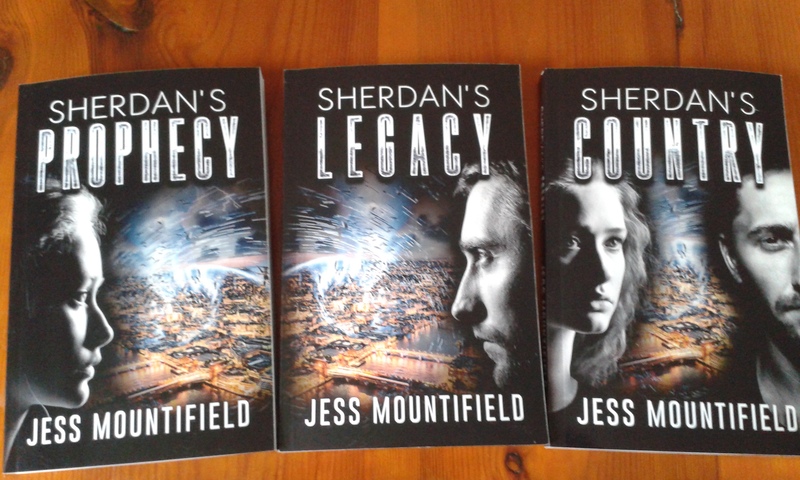 Recently both Sherdan’s Prophecy and Sherdan’s Legacy were moved over to the 2nd edition, complete with the shiny new covers. 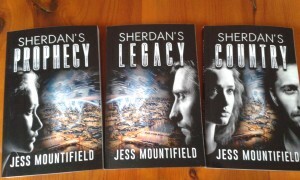 I’ve also recently published Sherdan’s Country, the third book in the series, and that has a matching cover to the new editions. While I try to get my books in print fairly soon after the ebook it sometimes takes a little while to sort out the logistics, but we’re finally all there. As you can see the new set look wonderful together, and I’m really pleased with them. They make me want to work on some further plot ideas for Sherdan’s world just so I can have some more with shiny covers like these. It’s just a shame I can’t think of a really good idea at the moment. As usual I’m selling signed copies of these myself, so if anyone wants one, drop me a message here in the comments or to my email address under about me and I’ll get back to you with how we can make that work. Now excuse me while I go back to stroking the shiny. So it seems it’s that time of year when it’s cold outside and everyone is catching colds. It’s almost midday and everything outside still has a layer of frost on it (which is rather pretty I suppose) and I’m curled up on the sofa under my favourite fluffy blanket. Although it’s partially because it’s cold and the blanket is warm, I also happen to have caught one of those nasty cold like viruses which has decided to spread into my sinuses. Yup, I have sinusitus, and as such feel like doing very little. I’m thinking of hibernating for a few weeks. Anyone want to join me? This was another bookclub book, and one I’ve wanted to read for a while. I’d heard lots about this book before I read it. 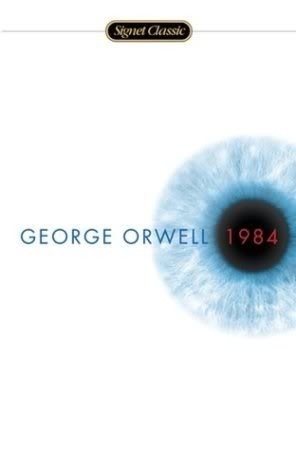 Plenty about Big Brother and the idea of a controlled nation where no one could think for themselves but nothing quite prepared me for what I found once I read it. For one it’s also partially a romance. The main character falls in love and it’s the motivating force behind lots of his decisions. As with most classics its not the easiest to read language and there’s some very complicated thoughts and ideas in the book, with things like doublethink and thoughtcrime as words for what you should and shouldn’t do with your thoughts. The explanations of doublethink especially were interesting and suggestive of the delusional way we convince ourselves that a bad thing can be a good thing when in powerful positions. I can see why the book is still so popular. Given that it was written over seventy years ago it has incredibly accurately predicted some aspects of human life and where the world is at now. George Orwell had a good handly on human nature, our drive to discover and invent, and our attitude towards war and other nations. Not an easy read, and the romance was rather dry and emotionless, but still a book I’d recommend for the ideas and thoughts it might provoke. A very good book to discuss after reading. This is a little later than I hoped but it took some more tweaking to get it straight than I thought. My plan for the year. I’ve got quite a lot written that needs to be published and a lot of it is already with the editors so I expect there to be quite a flurry of releases this year. I’m hoping I might even manage one per month. The first expected release is a fantasy prequel of mine, The Hope of Winter, within an anthology called Flights of Fantasy. It’s to raise money for another good friend who has been diagnosed with cancer. The next few releases will be collaborative works, also mostly sci-fi and fantasy. There will be more on those as they get closer. I also have plans for lots of Mycroft Novellas. The second and third are written but I also want to write at least two more this year. On top of that I’ve got a significant chunk into the sequel to With Proud Humility. I fully intend to finish that this year and then get started on the next one of those, although the last one might not be done in time to publish this year. With the collaborations and all the Fantasy stuff I have already that’s looking like 10-12 releases. I’m very excited, although I’m aware that’s going to be a lot of hard work. I’m sure it will all be worth it. So I’ve finally seen all three of the films in the new Peter Jackson series, and I thought I’d make a post about what I did and didn’t like. In the first film, I liked that it had a more light-hearted feel to it than the Lord of the Rings films. The chases had me laughing and so did the Dwarves antics in Bilbo’s house. considering how much more light-hearted the Hobbit is to the Lord of the Rings in book form that sat well with me, but I noticed a lot of people who hadn’t read the books and were introduced to the series by the films were annoyed by those scenes and thought them unnecessary. I didn’t like the new pale orc stuff as much nor the rock giants, but over all I enjoyed the film. I quickly realised it was a sort of in between feel to it. Less light-hearted and more over all world in it than the Hobbit book, but more light-hearted and focused than the previous films. I think this only led a lot of people to be disappointed. All the people who expected Lord of the Rings got more Hobbit than they wanted a vice-versa. As I didn’t mind either way I was very happy with the film. I think it blended the feel of the two together nicely. The second film was probably the best, of the three. I liked the extra Necromancer stuff in here and what Gandalf got up to. 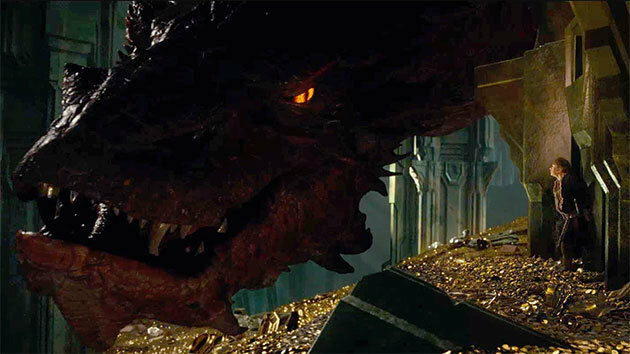 I also really liked how they introduced Bard and the Smaug and Bilbo scenes were amazing. Some of the Legolas stuff wasn’t as good, but I liked what they did with his father and how they showed the differences between the two elvish races. There was the odd bit I didn’t like so much, but very few parts of this film. I didn’t like where it finished, but I tried to think of a better place and really couldn’t. If the moved the end later to include more Smaug stuff it didn’t leave enough plot for the third film and if they moved the end sooner it would have needed to be a lot sooner or still be in the middle of the Smaug plot thread. Finally, I think the third film is the weakest. 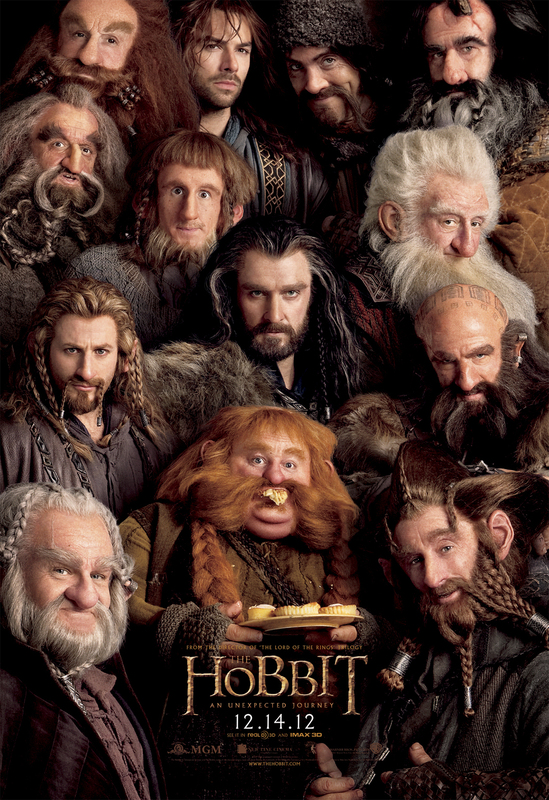 This is the film that suffered the most from the Hobbit being so much shorter than Lord of the Rings. It had the conclusion to the Necromancer and Smaug near the beginning of the film and both of these would have served the film much better if they were either more complicated and didn’t start the film or just moved to the second film. Maybe the Smaug section could have been in film two and the Necromancer stuff in film three, but then Gandalf wouldn’t have been in film two very much at all (see, I told you I couldn’t find a better way to divide it). I’d have liked a longer resolution to the Necromancer plotline for sure. After adding in all the stuff Gandalg got up to it was very lacking on imagination and scope. 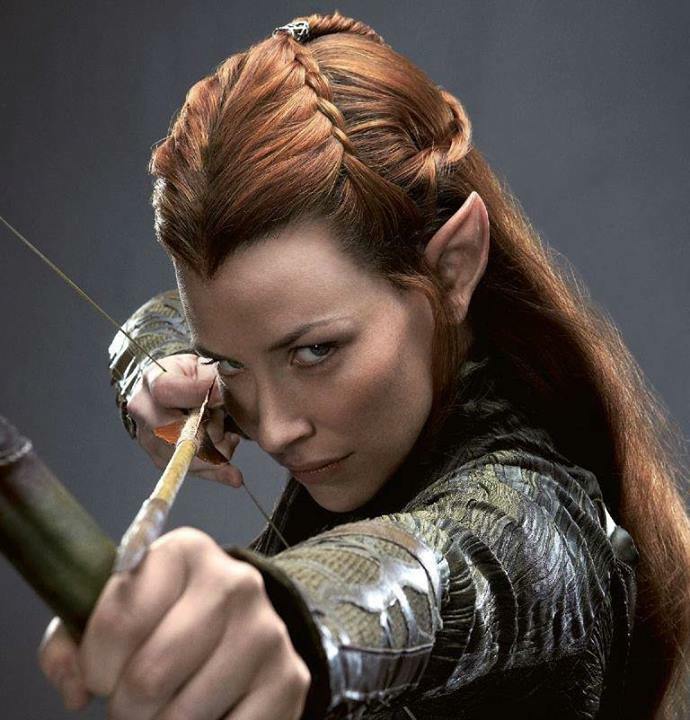 I liked the set up for the final battle and the way Bard handled himself, as well as the interplay between Thorin and Bilbo, and Legolas, Tauriel and Thranduil, especially concerning love and what happened to Legolas’ mother, but that was about it with the third film. I didn’t like Alfrid at all. I assumed he was in film three for the comedy value (like the chase scene in the Goblin lair and Barrel scene in the previous two films) but I didn’t find him funny at all. I did find Billy Connelly as Dain funny and Gandalf had the odd amusing line. The conclusion to the Pale Orc stuff was predictable but good enough. Anything else I could complain about would have spoilers so I better stop there. I have a feeling the Hobbit films would improve on me if I could watch them in one go. There just isn’t as good a way to break them up as there was with the Lord of the Rings. I also want to see what’s included in the extended editions. If there’s more Necromancer it could improve the third film a lot. after that I want to watch all six extended movies in one go and see if it does what I think where the third Hobbit film sets up some of Lord of the Rings and creates a natural progression that weakens the third Hobbit if you treat the trilogies as stand alones. Happy New Year everyone! It seems every year at this sort of time I talk about the little investment I made in Entropia and how it’s doing. The previous post on the subject is here. This year has been very exciting in that regard. I’ve managed to more than double the initial amount and it took a little under three years. It very much makes me wish I’d bought more of them, but I said that last time. I also mentioned last time that there were now three types of deeds. On top of that I did deposit my first amount into the game and I’ve bought a few more deeds of various types. The main Calypso deeds that match the initial investment have continued to payout at a steady rate and the new smaller Arkadia deeds have provided a nice daily boost, but neither have performed quite as well as I’d hoped. Not badly, but a little below expectations. I thought I’d provide a handy little breakdown though of the payouts. As you can see, they did better in their first year and have been declining a little since. I’m expecting payouts to go down a little more but stabalise soon. The current sale value of the deeds are approx $142 meaning the very first one would give me a return of $210 if I sold everything now, although you could say it’s made me more than that as the payouts have been used to buy Arkadia deeds which have also given me payouts. It doesn’t look like the Arkadia Deeds have done so well because each one has made so little, but for $142 it’s currently possible to obtain roughly 30 arkadia deeds at a value of $4.6 each, which is a little more than the price people are paying for bulk amounts although a little less for singular deeds. With that factor taken into account the equivalent yearly amount would be $4.71 which makes them worth about $10 a year instead of the $18.66 the large deeds earnt in 2014. Obviously that’s not as good, but it’s still something in the stepping stone to another larger deed. The third type of deed isn’t paying out yet. It’s attached to the pet system that’s meant to be coming in an update due sometime in the next few months, but I’ve got one of those to be able to track payouts from day 1. Predictions aren’t normally my thing but I’d like to make a few about the next year or so of investing. I think the payouts on the Calypso deeds is going to drop to about $15 per year and hold steady there. The price isn’t going to rise much more, but level off somewhere in the $140-150 mark. The Arkadia deeds price is going to go back to $5 until the original 200,000 are all sold, and the payouts are going to go up as well, so the equivalent number of deeds will be around $15 per year as well (this will mostly be due to the recent changes in space travel within Entropia that make it easier to live on planets like Arkadia over Calypso). When the third type of deeds go live I expect there will be an initial drop in prices of the other two as people sell them to buy more of the new type. I think that will be caused because the initial payouts will be really good on the new deeds (everyone will be wanting to try the new system generating a really good first few payouts). Then everything will settle down again a bit and hopefully the value of all the deeds will reflect the payouts so returns on all of them equalise a bit more. All in all, as long as the game and its makers don’t disappear I think it could be a very nice investment to hold onto and generate annual payouts around the 12-15% range, and as I mentioned earlier I’ve deposited a little to buy more deeds so I’ll also have to weigh up a good time to sell up and withdraw everything. Who knows, maybe I can keep doubling the money until I’ve got a retirement fund!